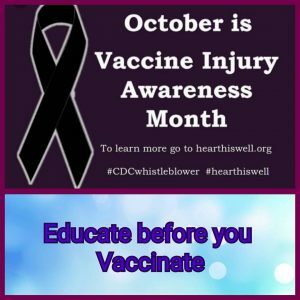 Facts you need to know about vaccines! Posted by Marguerite	| October 17, 2016	. For your knowledge. We do have the choice to vaccinate or not. It is Flu vaccine season and everywhere you turn you see signs and ads – GET YOUR FLU SHOT!!! Rather you choice to get the vaccine or not, do your research and also take other steps to build your immune system strong. Healthier foods (Junk foods weaken the immune system. Detox and get on a healthy herbal colon cleanse. (See me for my recommended programs and ask me about my ZYTO Compass Scan for your personalized program. 10 reasons why flu shots are more dangerous than the flu! This video explains to whole concept of vaccines and the side effects and why they aren’t that effective and what they really do. He says 90% of doctors and nurses don’t vaccine their families or selves!! !